Oh, hello Internet. It has been a while. I was looking back through my blog posts and realized that, as much as I have been wont to neglect this blog at other points in the year, I have written a Valentine’s Day-themed post every year for the past three years. And I do not mean to break that trend this year. One of my favorite hobbies is cooking. I was the girl in high school who would bring a cake to lunch, frosted and all, on a random school day just because I’d had an impulse to bake the night before (Shout out to all my high school friends who I made my guinea pigs.) For me, cooking is a constructive way to relax at the end of a stressful week, and I’m always looking for new recipes to try. This is my first Valentine’s Day in several years that I’m in a relationship (tee hee.) While going all out for your special someone and buying them an expensive dinner is awesome, the thought of spending a ton of money on a meal you may not even like didn’t appeal to me. 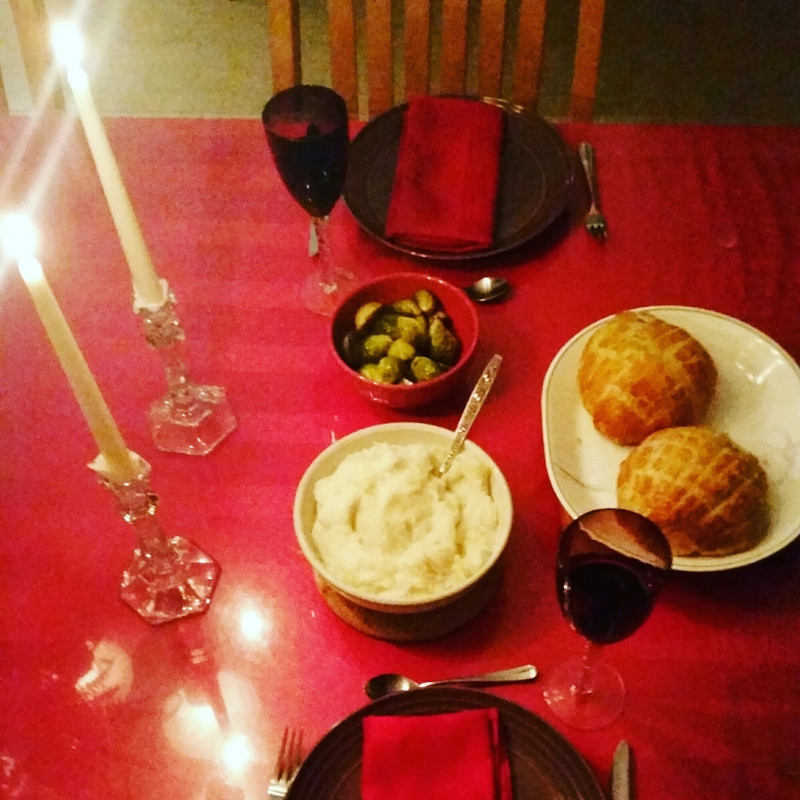 So my boyfriend and I made our own V-Day dinner, and it was more special and romantic than anything I could have ordered at a restaurant. 1. It’s a chance to put your Pinterest board to use. Am I the only one who finds that a good 40% of my Facebook news feed is comprised of cooking videos? I’m not complaining, but I find so many amazing recipes browsing through my various social media feeds that I almost never try. Valentine’s Day is the perfect excuse to scroll through your Pinterest board to find that one recipe you’ve been dying to try. There is a recipe out there for every taste, budget, and skill level, so get creative! If you are somehow gifted in the art of scoring restaurant reservations on a busy night without waiting until 9pm, please teach me your ways. But even if I go out to eat on another night besides Valentine’s Day, I’m not a fan of screaming across the table at my date just to hear them over the ruckus. While I have so much respect for restaurant employees that work as hard as they can during busy hours, I would prefer to have a dinner where we can have a normal conversation and eat on our own schedule. And not have to sit shoulder-to-shoulder with a couple in the middle of an argument. Awkward. 3. Your wallets will thank you. Speaking of restaurants on Valentine’s Day, most of them ain’t cheap. Even if a restaurant is reasonably priced, dinner plus drinks plus maybe dessert adds up. Side note: don’t be that guy who doesn’t tip your server, on Valentine’s Day or otherwise. When my boyfriend and I went grocery shopping for our V-Day dinner, we ended up spending way less than we would have at a restaurant and had a really fun date in the process. Plus, we had plenty of leftovers for our lunches the next week. 4. It’s an exercise in teamwork. You know the cliche relationship advice, “You never truly know someone until you travel with them”? Cooking with your partner is a much cheaper microcosm of that theory. When you have a common goal (i.e. a semi-edible meal), it fosters communication, trust, and compromise. You get a glimpse into how your partner solves problems, handles stress, and acts as a leader. And on a much more basic level, you learn what their food preferences and cooking styles are. For example, I learned that while I add salt and pepper to the whole pot of mashed potatoes, my boyfriend prefers to let people add their own seasonings to taste. Maybe I’m just new to the whole personalized mashed potatoes thing, but it was something I never would have known about him had we not cooked together. 5. Even if your dinner burns to a crisp, it’s a memory shared. No matter how inedible the fruits (and veggies) of your labor are, cooking together to celebrate is sure to be a wonderful memory for you and your partner. And there’s nothing better than laughing about your charred lasagna over pizza and beers. No matter what your plans are, whether you’re celebrating romantic love or any other type of love, I’m wishing you une bonne Saint Valentin! Question of the Week: What is your favorite recipe to make and share with others? Tell me in the comments; I just might have to try it! Since the summer I turned 17, my life has been a series of comings and goings. My first time leaving home for an extended period of time was in July 2009, where I attended a month-long theater conservatory two hours away. Then, when I was 18, I left New Jersey to go to college in upstate New York. In both cases, I was more than ready to leave the suburban bubble I grew up in and see the world, not really thinking about what and who I was leaving behind. When I was 20, I left for France for the first time with the comfortable notion that I would be home at the end of the semester. And two years later, I went back to France with the same comfortable notion, though the time of return was significantly further away. I’m thankful that I’ve had the opportunity to live in so many places and meet all different kinds of people. However, in my wild dreams of adventure and ambition, I rarely thought about the people I was leaving behind. In the coming weeks, several good friends, including my own sister, will be leaving the New York metropolitan area to pursue the next step in their education and/or careers. Most likely, I won’t see some of them for many months or years. In past situations, I could handle the separation easily because more often than not, I would be leaving too; graduation never really affected me because I was so focused on where I was going next. This time was different. They were leaving for an extended period of time. I was staying with no immediate prospect of leaving. It is always easier to leave than to be left behind. After I left book club Tuesday night, this crushing realization moved me to tears. I was angry with God and with myself. I felt like I was being punished for my insatiable wanderlust and my disregard for the sacrifices made by my family and friends, especially my parents, so I could travel. I wondered if I had thrown away relationships and opportunities at home, and if I had made the right decision in leaving at all. As I stood on line for the bus, I saw a familiar face a few people behind me. It was the face of a high school friend I hadn’t spoken to in years. Both of us, in our turn, had left our hometown for college, study abroad and different jobs. Now, we had returned. We spent the whole ride catching up, talking about old times and books and current plans, and parted with hopes of seeing each other again. As she got off the bus, I thought of the other friends I had made and remade since coming home, of the opportunies I’ve had in New York, and of my growing relationship with my family. I knew that I was back in New Jersey because there was something for me to do here. I did. I do love my friends and my sister well enough to let them go. Go ahead and laugh and say, “Well that’s the harsh reality of life.” However, I’ve found that merely accepting reality does nothing to relieve the bitter flavor of the situation. Responding to a situation with unconditional love does. Since I have received such unconditional love and support from my family and friends for any adventure I felt called to chase, I can do nothing but the same for anyone else. Love does not hold. Love liberates. So I love you. Go, and I will stay. First of all, congratulations! You’ve probably been hearing that a lot lately, whether in person or in a card, and the well-wishes are probably oozing out of your ears. But seriously, take a moment today to say, “Yes, I did it.” I know you’ve just finished finals, res life is kicking you out of your dorm in 6 hours and you definitely don’t have enough boxes for all your stuff. But amid all the craziness, take a moment for yourself to soak in and remember the day by. OK, that was the preliminary advice. Now for the actual point of this letter: be a work in progress. Yes, you’ve worked hard and accomplished amazing things, but you’re only at the beginning. And despite what you might tell yourself, it’s OK to not have it all together. It’s OK to be scared, confused, and anxious about your future. Not having a job or internship lined up after graduation doesn’t make you a failure. Delaying further education doesn’t make you unfocused. Taking a gap year doesn’t make you lazy (just ask Malia Obama.) And on the other side of the spectrum, it’s OK if your first job or grad school program isn’t right for you. Don’t measure your self-worth based on where you think you should be at this point in your life. You are more than your resume. So what do I mean when I say “be a work in progress”? I mean that you should allow yourself to explore, grow, make mistakes, and change your mind. Nobody has it all figured out. And if you think you have it all figured out now, you’ll be amazed at how quickly and radically your plans can change. Being a work in progress does not make you a failure, or unfocused, or lazy. It makes you human. Even the top professionals in any field, who have decades of experience, are constantly growing and working toward the next goal. Be a work in progress. Take a step toward your next goal every day, even if it is a very small step, like sending out three job applications or putting aside just a small amount for an apartment or for grad school. Make it a concrete step, not just a thought, but an action. Don’t be too proud to ask for help. You are not alone. Your small efforts will add up and you will start to see progress. Be a work in progress. When you wake up every morning, try to be a more patient, more generous, more loving person than you were the day before. It is never too late to try again, but that doesn’t mean it will be easy. It will be difficult, especially when everyone else around you is becoming more self-serving. But it is not impossible. Be a work in progress. Surround yourself with other works in progress. Inspire each other and cheer each other on. In a world that constantly demands a finished product, be brave. Be a work in progress. Congratulations to the Class of 2016, especially my sister, who graduated two weeks ago, and my cousin, graduating this weekend. All great conversations start over a bottle of wine, am I right? OK, maybe not all of them, but many certainly do, like the one I had last week at a friend’s potluck. Whenever the word “date” is dropped in a conversation, it seems like every head in the room turns to be a part of it. We all have something to contribute, even if our personal dating experience is limited. In this particular instance, a girlfriend and I were sharing our frustration at many guys we knew who couldn’t pluck up the courage to ask someone out. One of our guy friends overheard this and immediately put his two cents in. Soon, the entire party – 10 or 12 people of different backgrounds and ages – sat in our hostess’s tiny living room debating until late into the night. Who should make the first move? Why are men so terrified to ask the question? Why do women guard themselves and expect others to read their minds? How does dating even work nowadays? I do not have the answers to these questions. Sorry. However, the one thing I took from that discussion is that “date” is the scariest four-letter word. And we need to use it, now more than ever. Ugh. That was a frustrating sentence to type. Wouldn’t it be so much easier if one of them had said, “Will you go on a date with me?” or even “Is this a date?” Boom. Problem solved. I and others I know have been on way too many “non-dates”: meetings that seemed like dates, but neither party used the word “date.” And let me tell you, there is nothing more maddening than trying to figure out what that non-date meant. Let me be clear: I’m not attacking men in particular. Women, or the person on the receiving end of the offer of a date, should be able to demand clarity. I’m also not saying that men and women can’t go out as friends. I’ve gone out with men as “just friends” and had a great time! In those cases, the guy’s intention was clear, the pressure was off, and I could just relax and be myself. And the same goes for actual, romantic, I-like-you-that-way dates. A date is just a date. It’s not a marriage proposal, and it doesn’t even mean you two want to be in a long-term, committed relationship. It’s just a date. So if you are planning on asking someone out, please, please use the word “date.” Conversely, if you receive an invitation, please ask for clarification: “Is this a date?” It’s a scary word, but we need to use it. Even if someone says no, I guarantee they will appreciate your courage and honesty. And, if that person says yes, congratulations! Now your first-date jitters will stem from butterflies when you see your date coming toward you and not asking yourself whether you’re on a date at all. What’s your most awkward first date story? Share in the comments below! After my Lenten dating fast in 2014, I decided to start seriously praying for my future husband. If I’m meant to be married, it must mean that the guy I’m going to marry is out there somewhere, even if that somewhere is Mars. I remembered a Steubenville Women’s Session led by Jackie Francois Angel, where she talked about a prayer journal she kept for her future husband. On the first few pages of the journal, she wrote out her “husband list,” or everything she wanted in a spouse, and she wrote prayers in that journal every month for three years. She re-met her future husband when the journal was almost full. I don’t know if the timing will be as awesome as that for me, as I have a lot of pages left in my own “future spouse” journal. But as I’ve written in this little book over the past year and a half, I’ve realized this practice is much more common than I thought. After doing a little research among Christian female bloggers, I’ve found that Christian preteen girls are generally encouraged to make their “husband lists” way before they’ve started dating, so their filtering system for any future love interests is all based on speculation. I had gone through several relationships and many awkward dates before I started my prayer journal, so I had a semisolid idea of what I wanted and didn’t want. I didn’t tell anyone about it because I thought it would be seen as totally antiquated in today’s culture. So imagine my surprise and relief when my best friend since sixth grade, who isn’t Catholic, told me she had made her own future husband list! So without further ado, here are my 10 rules to keep in mind while making a “future husband” list. 1. Eliminate any physical characteristics. It’s OK to be attracted to certain physical traits moreso than others, and mutual physical attraction is important in a relationship, but don’t write someone off because they have brown eyes instead of blue. If that seems silly, maybe some secondary characteristics have made it onto your list. What if God handed you your perfect partner, but he was several inches shorter than you? Would you really turn him down over that? I hope not. 2. List traits that YOU are looking for, not what makes other people happy. One of the merits of the future spouse list is that it’s a great personal reflection exercise. If you’re someone who keeps a to-do list or writes down the pros and cons when making a major decision, this is a wonderful way to organize your thoughts. Remember, this list is for you. It’s not for your mom or your parish priest, and your professor isn’t going to grade it. So don’t put anything on your list that you are not truly looking for in a lifelong relationship. 3. Don’t treat your list as a binding contract. I wrote my future husband list in the summer of 2014, but even after 18 months, there are several things I would add, delete, or change. It’s so easy to overthink this list, as if dating or life experience won’t fill in gaps along the way. God won’t give you a husband who has a gambling problem simply because you didn’t think to put it on your list! That said, if you’re still holding onto that list you made when you were 11, it might be time for a revised edition. 4. Separate the negotiable from the non-negotiable. Any physical characteristics? Negotiable. Common core values? Non-negotiable. Oh, and for the record, you two don’t have to like all the same things. Sure, friendships and relationships usually begin due to common interests, and it is important to have some similar interests with your spouse. However, our individual hobbies and interests are what make us, well, interesting. Don’t expect your husband to give up one of his interests because you don’t share it, just like you wouldn’t want him to tell you to give up a hobby that you love because he doesn’t like it. To recap: A guy who will binge-watch Gilmore Girls with you? Negotiable. A guy who is your biggest fan even if he doesn’t like/understand what you like to do? Non-negotiable. 5. Look for constant effort, not perfection. As the chaplain of my college’s Catholic community always used to say, we’re not perfect yet. Faith is a journey. There are going to be good days and bad days, and you won’t always be the best version of yourself. Don’t look for someone who doesn’t ever make a mistake because he doesn’t exist. You will both make plenty of mistakes in your dating relationship and especially, especially in marriage. The key is that both of you choose to love, choose to forgive, and choose each other, no matter how many times you screw up. 6. Be your future husband’s prayer warrior, not a seeker. Seriously, your husband’s not a Golden Snitch. He’s a human being with thoughts, feelings and issues, just like you. Let’s face it: being a young person of faith can be really hard in today’s world. We need the prayers and support of others, and I guarantee your future husband needs your prayers, even if you have no idea who he is yet. This piece of awesomeness comes from another Steubenville talk by Sarah Swafford, and I think it nails the point of making the husband list. It’s a form of discernment — not just of who you want to marry, but who you want to be, regardless of marital status. If you want a husband who goes to daily Mass, you should be at daily Mass. If you want someone who’s close with his family, make sure you carve out time to spend with those you love. Make a separate list of goals that have nothing to do with getting married. Whether God calls you to marriage or to a different vocation, you should constantly be working on yourself, while remembering that you are a beloved daughter of God. 8. Forgive yourself and him. Once again, people make mistakes. We’re broken. Getting into a relationship doesn’t make your problems go away; in fact, once the honeymoon phase is over, all your faults, issues and insecurities will rise to the surface. It’s up to you to decide whether you will stick it out, or walk away. Granted, if the guy you’re into exhibits any of the traits on Crystalina Evert’s “Dump Him” List, well, do as the title suggests. But don’t expect a perfect partner. You’re not perfect, either. I once read a quote from a woman who said that she knew she found “the one” when she found a man with faults she could live with and virtues that she didn’t want to live without. 9. Remember who the real Bridegroom is. One of the most frustrating pieces of advice you hear as a Christian single person from well-meaning adults is, “Make Jesus the love of your life.” The frustration is twofold; on one hand, you don’t know how to do that, and on the other, despite this advice there is an unbelievable amount of pressure to date someone, anyone, just to have a relationship. To be honest, I’m still trying to figure this one out. But one thing I’ve learned is that a relationship with Jesus takes effort, just like any human relationship. Walking humbly with God is a daily choice. Jesus is not going to be the love of your life if you don’t let Him. And believe me, you, as part of His Church, are already the love of His (everlasting) life. 10. It’s not all about you. Repeat after me: Marriage is not just about making you happy. The sacrament of marriage is beautiful, but it requires hard work, patience, forgiveness, kindness, and putting someone else’s needs before your own — even when you don’t feel like it. If your list sounds a lot like a Meghan Trainor song, you might want to scrap it and start over. So to all my single ladies and gents (and those in relationships), Bonne Saint Valentin! Question of the Week: I just want to hear your thoughts on this topic. There’s so much to talk about, so leave me a comment!